As I mentioned in a previous article, a combination of good art and fun game mechanics is a very effective way to attract players and create immediate engagement. But even good game mechanics can get repetitive and tedious over time unless they are accompanied by a larger meaning or drive, which is often provided by other elements like story, and social connection. Events are much more meaningful if they are tied to a larger story. When playing basketball, scoring a basket is fun, but the experience is much more meaningful and powerful if that basket is the winning basket at the end of a game against a long-time rival team, even more if winning will let us get a scholarship to a renowned college… and will make us the first in our family to get a college degree… which will eventually let us to help our family get out of poverty and… you get the idea. The more your players can relate to the story’s conflict and to what is at stake, the more compelling your story will be for them. The faster you can introduce your players to that conflict and why it matters, the sooner the easier it will be for them to find meaning in the activities and goals they need to complete. There is an old axiom in Hollywood that says: “show don’t tell.” If you want to communicate how courageous a character is, don’t say it, instead show the character doing something courageous. In the same book for video game storytelling I mentioned above, Evan Skolnick says that in games, where the players are active participants, this axiom can be modified to: “do, then show, then tell.” If you want to communicate how courageous and powerful a character is, give her powerful abilities and give her big challenges to face, instead of telling the player the attributes of her character, let her can experience them herself. If you cannot find a way to communicate story through actions, then use visuals as a second option, and only if there is no other way of conveying important information that your player needs in order to make sense of what she is doing, say it through dialogue or text. The right story makes the game more intuitive, but to do that it needs to be simple. It can get deeper and more complex as the game progresses, but their primary goal is to make your game’s goals and rules easier to connect with and easier to understand. If the story is not making it easier to play, chances are it is not the right story. The story should also be kept at a minimum. One of the main mistakes that game developers make when adding story is trying to communicate at the beginning of the game all the background of the story to the players. Players do not care about your story details or your characters until they are more invested in the experience as a whole. It is important to provide meaning, but you don’t have to provide the player with more information than the bare minimum to make your immediate goals and activities make sense. The worse thing you can do is present and player with a bunch of information that they don’t yet care about. Long dialogues and explanations are usually skipped and all your work will be in vain. Start simple, and add complexity only if the rules and goals of the game require it. Evan Skolnick divides story facts into 3 categories: first, facts that you need to know right now to understand what you need to do in the experience; second, facts that will be important later in the experience but you don’t need to know yet; and third, facts that maybe add flavor but are not essential at any time in the experience to understand what you need to do. As a rule, the only information you really need to give the player is the one related to the first category. Save the rest for later and even then try to convey it first through actions and visuals. Let’s look at Chess as an example. It maybe an extreme case but I think it exemplifies the points that I am making. The conflict is simple and easy to understand: you are a king with a court and an army, your enemy is another king with his own court and army and you need to defeat him. There are other details in the story about who is in your court, which characters are important and powerful, how big is your army, etc., but all that information is communicated through actions and visuals. You know who is your enemy because your team is one color and your opponent is the opposite color. You know that there are different characters because your pieces have different shapes. You know who is in your court and how powerful they are because your different pieces have different attributes and behaviors, and some of these attributes prove to be more powerful. The story is simple and minimal. It helps us make the rules and goals of the game more intuitive; like the fact that only knights on horses can jump other pieces, or that the most important piece is the king, but it does not give us additional information that is not essential to understand what to do next. Story is an important tool to help us add meaning and connect emotionally to an experience. But the wrong story could turn into an annoyance to the player. By following these 3 rules you can avoid wasting time and resources developing stories that don’t help your game: 1) Introduce a clear and easy to understand conflict as soon as you can. 2) Communicate your story through actions first, visuals second, and only as a last resort through dialogue and narration. 3) Keep the story simple and minimal, give you player only the information than helps him/her understand what he/she needs to do in the game at that point. What makes a game successful depends on your goals, sometimes it is revenue, sometimes it is number of downloads, impact on your players, etc. However focusing on these outcomes is usually not very helpful as a developer, it is much more helpful to define success in terms of engagement because engagement can be linked directly to the kinds of decisions we need to make during development. In a previous article I mentioned how engagement follows a 4-step sequence: stand out, connect, engage, and grow. 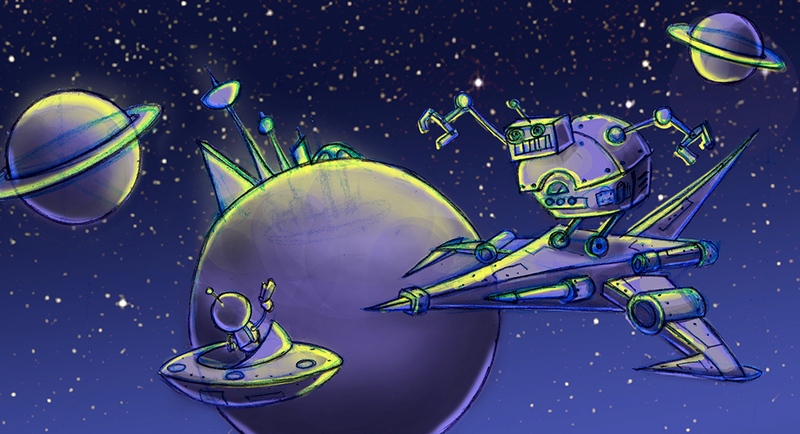 The next step is to figure out what are the ingredients in a game that can help you do that. In this article I am going to talk about 5 ingredients that will help your game or VR experience be more engaging in the long-term. ART – Art is what first catches your players’ eye and makes them want to take a closer look at your game. At first players won’t know much about the specific mechanics and stories in your game, it is through visuals that resonate with them that they decide to pay more attention. FUN- But art by itself, no matter how cool it is, won’t keep your players for long. Finding fun stuff to do that is easy to understand, with clear goals, is what makes players want to stay more than a few seconds. STORY- Even fun activities get repetitive unless there is a larger meaning and purpose. Having a longer-term purpose or story that players can relate to is what makes them want to keep coming back. Shooting hoops is fun, but doing it everyday for hours can get boring quickly, unless the activity is part of a larger story like training to defeat an old rival team. COMMUNITY- All good stories need an ending, but the meaning and purpose that you get from being part of a community can last for years. The games that we keep going back to over and over are the ones that let us connect and be around people that we care about. All these four elements are important to create a successful game that follows the sequence stand out-connect-engage-grow, but some are more important for one step and some are important for others: standing out depends much more on the art and how things look like than on the details of the story, but engagement depends much more on the mechanics and story than the art, and growing depends heavily on the community building aspect. I’ve seen many good games that don’t succeed because they lacked one or more of these important elements. It is also important to notice that most games, from free-to-play mobile games to VR experiences and educational games, will benefit from having all these ingredients. If you decide that you don’t need one of these ingredients, if you think don’t need a story or you don’t need community building mechanics, at least you should have a clear reason why not, and you should have an idea of how are you going to get your game to stand out, connect, engage, and grow with the ingredients you choose to include. There are other elements in a game that are very important like monetization, which is essential to make the game development sustainable. Or marketing, which can help your game get noticed. But the part of marketing that I think is more essential is not the promotion itself, but defining and thinking about your target market, and getting feedback from your target players all through out the development process. 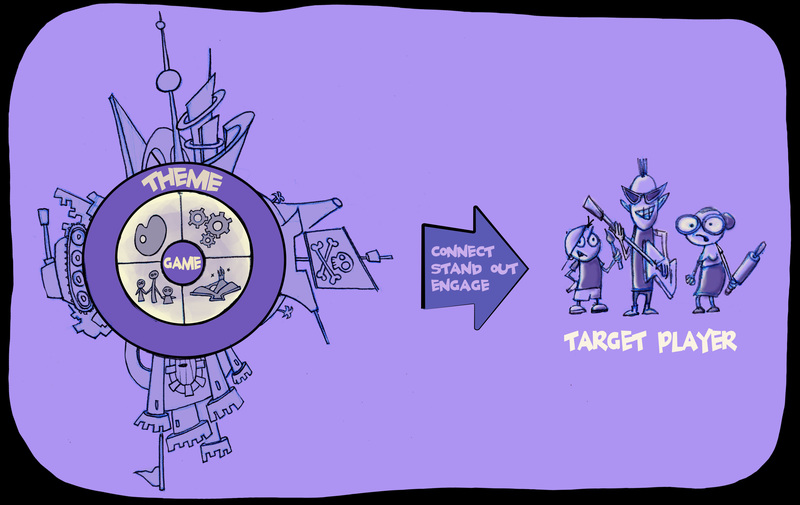 Then, your art, mechanics, story and social mechanics will resonate with your players, and your marketing will be embedded into your other elements. What I’ve noticed through the years is that games are much more powerful and effective at engaging players when all the elements mentioned above -art, mechanics, story, and social interaction- work together and reinforce each other. 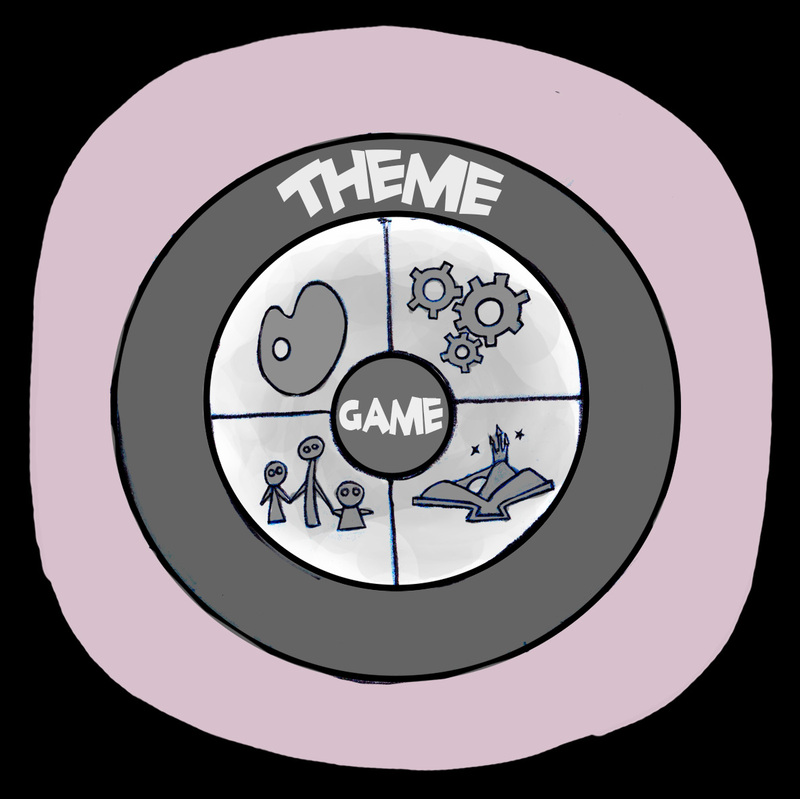 Having a strong “theme” will help tie together the elements of your game and will make much easier to connect emotionally with your players. But for a theme to do that, you need to have the right understanding of what a theme is. Theme is not topic. Saying you want to do a pirate game is not enough. There are many different potential approaches to a pirate game: is it about gathering treasure? Is it about fighting the law? Is it about ship battles? It is not about a conflict either. Defining your theme as the conflict between pirates and the Spanish Armada is not enough. You need to pick a side, you need to have an opinion about the topic or conflict you are talking about: ” A pirate life is a wonderful life, because it is more free and exciting.” When you state your theme as a clear point of view you get a much clearer idea of what mechanics and what stories you need. In this case, it all would need to revolve around the excitement of being a pirate and being free of responsibilities and commitments. In his book “The Art of Game Design,” Jesse Schell relates an example from when we worked on a pirate’s virtual reality ride for Walt Disney Imagineering and DisneyQuest. In his book he writes how as soon as we nailed down a theme for the ride, many of the design decisions about art style, game mechanics, story, and even technology became clear. As a result all these ingredients ended up supporting each other to create a much more powerful and award-winning VR experience. 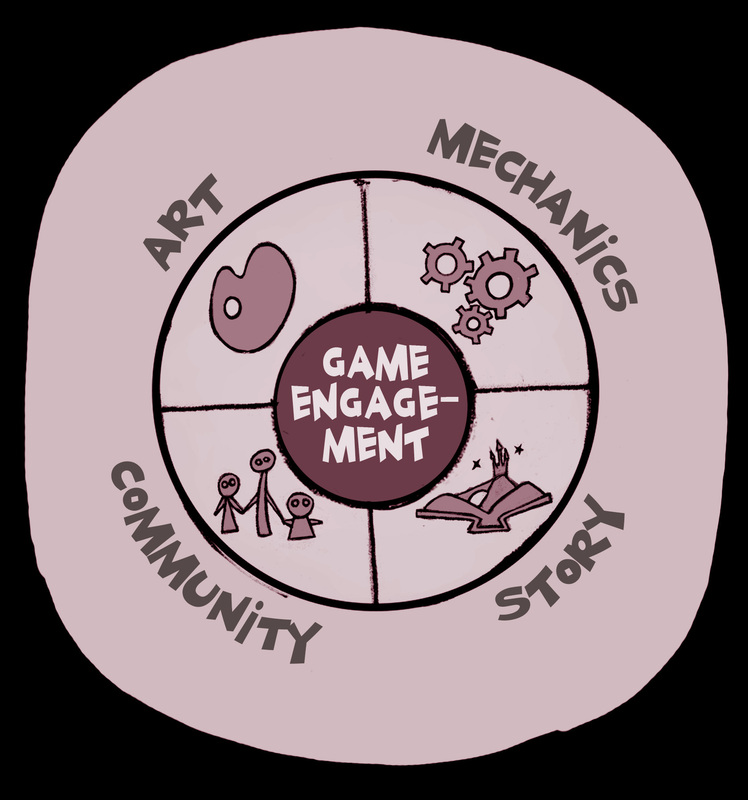 There are 5 ingredients that in combination help your game be much more engaging and successful: art, mechanics, story, community, and theme. When you put those things together in a game or experience: art that resonates with your audience, mechanics that are fun and have clear goals, a story that adds meaning and context, a community makes you feel part of something larger than yourself, and a theme that ties it all together and connects to points of view that you resonate with, you get a much more engaging experience, and your chances of success grow exponentially.